The car transporter range is no exception, providing a robust and reliable vehicle-carrying solution for motorsports enthusiasts, hire firms and motor trade professionals. Both vehicle recovery and motor sport are catered for within the CT115 and CT136 trailer range. Twin high tensile galvanized steel structures are mounted on the exclusive Ifor Williams beam axle suspension and combine to give a versatile, strong and easy to use vehicle carrier. The optional removable / adjustable front wheel chocks take the guess work out of positioning your vehicle. The heavy duty wheel straps (conveniently stored in the lockable toolbox) can be anchored at any number of perforations provided in the bed. 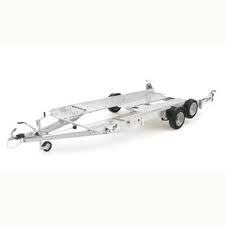 Detachable loading skids and rear steady legs allow the trailer to be stabilised at the perfect clearance angle. 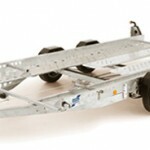 The loading skids stow quickly, conveniently and securely within the bed area. A winch mounting bar, bracket and a range of winches can be added to aid vehicle recovery. Click on the Accessories tab for further details.